Here at Inhabitat we love stumbling across re-purposed objects. 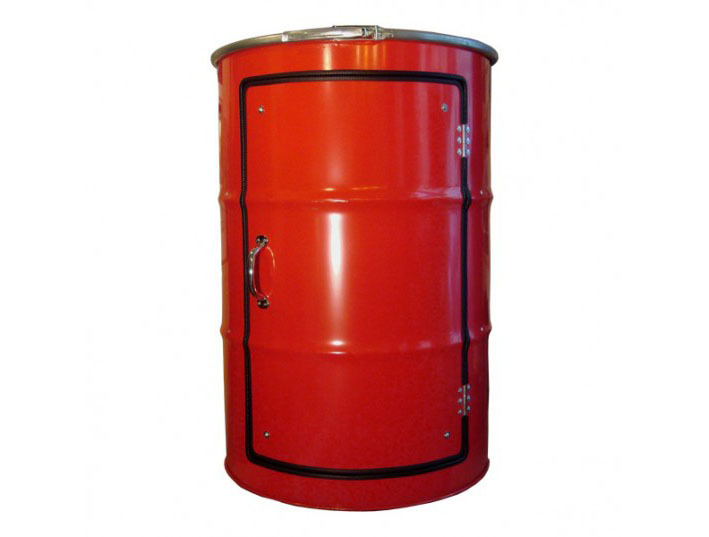 And appropriation is even sweeter when something destructive is transformed into a useful piece of design, like these colorful Oil Barrel Cabinets designed by German design group Lockengeloet. Using old barrels that have reached the end of their useful life – no longer leak proof – the Hamburg-based designers have taken to remodelling the form to give each barrel a new career as an eye-catching cabinet equipped with a set of sleek shelves set on the inside. The designers firstly use a special tin opener to cut a hole into the barrel’s casing, then stabilize a door with guitar strings for hinges and two magnets to close the doors. Lockengeloet’s other designs use the same ideas, adapting items in unique and different ways such as turning vinyl records into bowls and books into hooks for keys. Although they may seem a little pricey at €350 (or $500) these cabinets demonstrate how great original design can come from even the most unexpected sources. Have a look at their online shop for more information. Here at Inhabitat we love stumbling across re-purposed objects. And appropriation is even sweeter when something destructive is transformed into a useful piece of design, like these colorful Oil Barrel Cabinets designed by German design group Lockengeloet. Using old barrels that have reached the end of their useful life - no longer leak proof - the Hamburg-based designers have taken to remodelling the form to give each barrel a new career as an eye-catching cabinet equipped with a set of sleek shelves set on the inside. Using guitar strings and magnets the design team creates fully functioning doors.